First off, we're big fans of Pink Floyd here at quattroholic.com. That said, I could fill this article with all kinds of witty lyrical puns, or perhaps release a giant virtual pig to float across your screen. Instead, we'll try focus on Audi's 2010 Annual Press Conference. 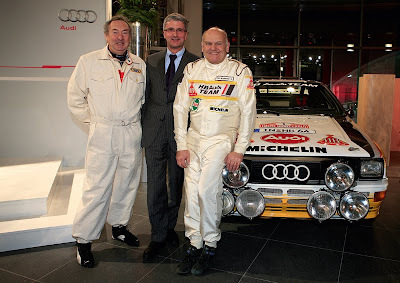 Above is a photo from the evening event showing Pink Floyd drummer and avid auto enthusiast Nick Mason and rally legend Stig Blomqvist together with Audi chairman Rupert Stadler. Overall, despite a challenging economic environment, Audi was able to look back at 2009 with pride and gratitude for an overall successful year. The 2009 Audi Annual Report is titled "Rethinking Luxury" and can be viewed in it's entirety by clicking here. Below are a few photos of both the Audi press conference and the evening event, all direct from Ingolstadt. Following the photos, you'll find the official press release regarding the conference and report. Despite the global economic and financial crisis the Audi Group is able to look back on a successful 2009 – thanks in part to its responsible, sustainable actions. Specifically values such as tradition, quality and a sense of responsibility have come to enjoy renewed significance in society once again. The Audi 2009 Annual Report, which was published at today’s Annual Press Conference, picks up on this idea. In the magazine section, renowned authors present articles that reflect a new understanding of luxury. In the financial section, strong figures demonstrate how successfully the Audi Group has steered a course through the crisis. The Audi 2009 Annual Report explores the headline theme of “Rethinking Luxury. A changing system of values: inspiration for a new lifestyle.” from a wide variety of perspectives. The authors engagingly describe the different aspects of a new, timely, understanding of luxury: setting aside time for the truly important things in life. Pursuing your dreams. Creating the space to explore your individuality. The articles also illustrate how the Audi brand, with its corporate philosophy and fascinating premium cars, is in harmony with this idea of clear, enduring values. Rupert Stadler, Chairman of the Board of Management of AUDI AG, goes to Milan to meet Andrea Perrone, CEO of the fashion house Brioni. At Brioni’s headquarters they discuss changing values, the new definition of luxury and the characteristics that the two brands have in common: quality, tradition and a hunger for new ideas. In a further encounter, Board Member for Finance and Organization Axel Strotbek discusses entrepreneurial and ecological responsibility with globalization expert Prof. Dr. Dr. Franz Josef Radermacher. One particular highlight of this year's Annual Report is a remarkable fashion story: Four graduates from the renowned Central Saint Martins College of Art and Design in London interpreted the character of four Audi models and translated them into extravagant outfits. The Parisian photographer Grégoire Alexandre then created an artistic ambiance for the Audi A1, the Audi A3 Cabriolet, the Audi A5 Sportback and the Audi A8 to present both model and its outfit in appropriate style. Audi first explored this novel concept of an annual report comprising magazine and financial section in 2005, and since then has won several international awards. Last July, the Audi 2008 Annual Report was voted the best annual report of the year by Forum Corporate Publishing e.V. Audi has therefore already won the biggest competition for corporate communications in Europe twice. The same accolade had previously been bestowed on the 2007 Annual Report. The online Audi 2008 Annual Report was also a success, being awarded both the prestigious reddot communication design award and the iF communication design award among others. The latest Audi Annual Report is appearing in a total print run of more than 90,000 copies, in the languages German, English and Chinese. Alongside the print version, an interactive online version takes the reader on a virtual trip through the Annual Report. The stories in the magazine section can be followed in audio and video features and slideshows at www.audi.com/ar2009: How did the young designers transform inspiration into creation? What senses are awakened when driving through the wild landscape of Galicia in the R8 Spyder? A modern navigation principle (push & swipe interfaces) on the start page creates a three-dimensional room. Rather like the touch controls on an Apple iPhone, all the content can be selected, zoomed in and fast-forwarded at the click of a mouse.